When conjuring images of Moscow, my imagination included only Soviet-style buildings and melancholy designs. After exiting the Leningradsky Vokzal, the train station with trains to and from Saint Petersburg, Moscow immediately proved me wrong. Moscow is like New York City. Modern skyscrapers tower the skies. Tourists and Moscovites wander crowded pedestrian areas. Moscow impresses with food creations and innovations, like adding cherries to a burger. Moscow is like London. Modern and historical buildings neighbor each other. A river divides Moscow, but architecturally-intriguing bridges attach the split city. 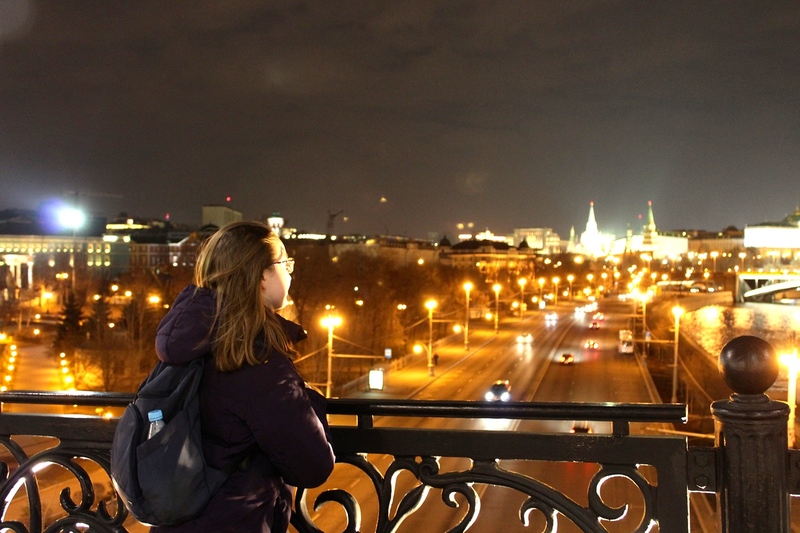 Moscow at night, especially along the river, is one of the most breathtaking city views to be seen. Moscow is like any large city. Attractions are packed with tourists and locals. Cars zoom around corners, then slam on their brakes and blow their horn at the congested traffic before them. Moscovites dress to impress on any occasion; leggings are a major no-no! Although Moscow resembles world cities in many ways, Moscow is one-of-a-kind. Soviet buildings are not few or far in-between; they remind you of the incredibly depressing and resilient story that is Russian history. Moscow Metro’s overcrowding problem disappears as one stares in awe at the towering statues, priceless chandeliers, and marble designs. 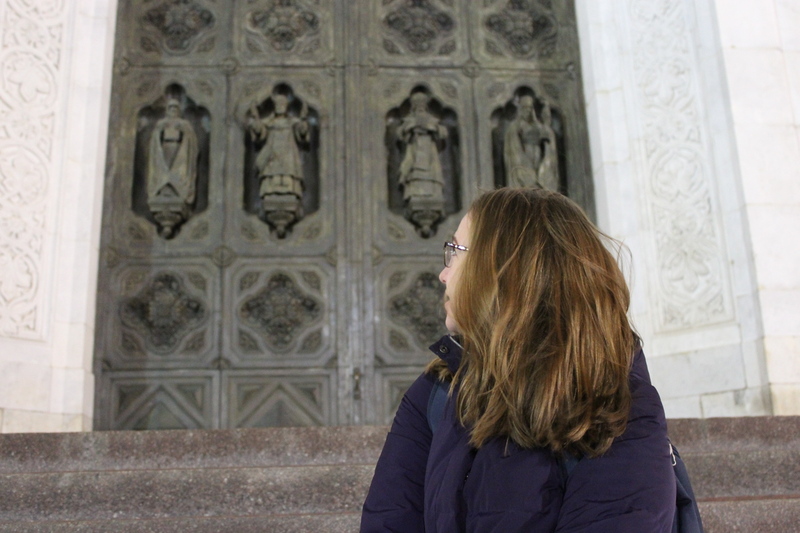 The city’s architecture shares secrets of Moscow’s history with all who pass. Today, I will share some of these secrets with you. The heart and soul of Moscow lies on the Red Square. Known by Russians as “Beautiful Square” (krasnaya ploschad), the capital’s backyard developed communist links from military parades during the Soviet Union. Today it is a meeting point for locals, a shopping epicenter, and historical headquarters. 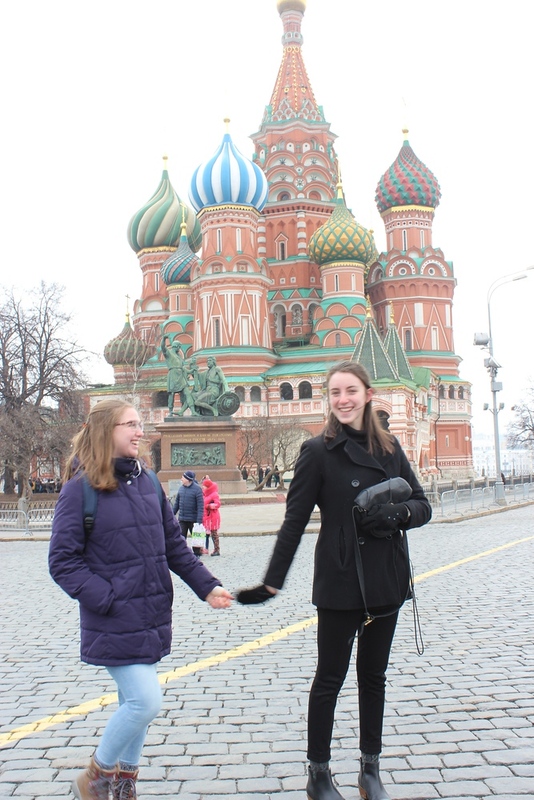 Moscow’s most iconic sights — the Kremlin, Saint Basil’s Cathedral, and Mausoleum of Vladimir Lenin — lie here. Two failed attempts to visit the Mausoleum resulted in me not viewing Lenin’s corpse, but I did spend a couple hours wandering GUM! Many Kremlins exist throughout Russia and none of them are a single building, as I falsely once believed. Kremlin means, “a town inside a town.” Kremlins are better considered as fortresses due to their towering walls, protecting what lies within. Red-brick walls and towers kept Moscow Kremlin’s seventy acres and over 800 years of politics and religious ceremonies safe. Here Russia’s political leaders have done their best (and worst) for the world’s largest nation. Many areas of the Kremlin are restricted from the public; police will ensure you don’t step out of bounds. Four churches, Patriarch’s Palace, the Armory, and more can be visited after purchasing tickets, dropping bags off at the luggage office, and going through security. 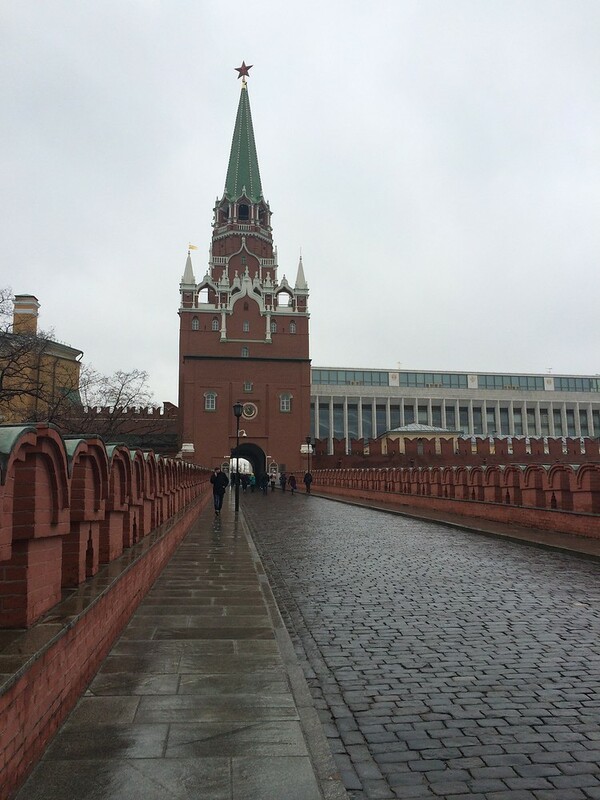 Although possible to tour the Kremlin alone, it is best to tour with a knowledgable guide. He or she will guide you through the main sights, inform you of the intense history, and entertain you with the Kremlin’s daily life. For example, many young and handsome Russian soldiers wander the grounds because part of the Kremlin hosts military barracks. Also, Putin argued with the World Heritage Site organization after the installation of a helicopter landing pad on the Kremlin’s grounds. 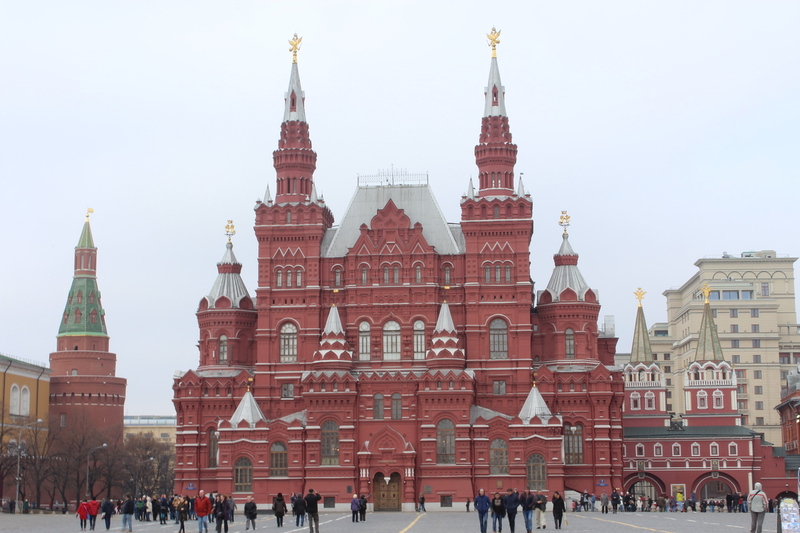 The first noticeable building within the Kremlin is a communist-style building, which greatly contrasts against the 1800s architecture featured in the rest of the Kremlin. After moving in the direction of the churches, a cannon and bell will be in the way. 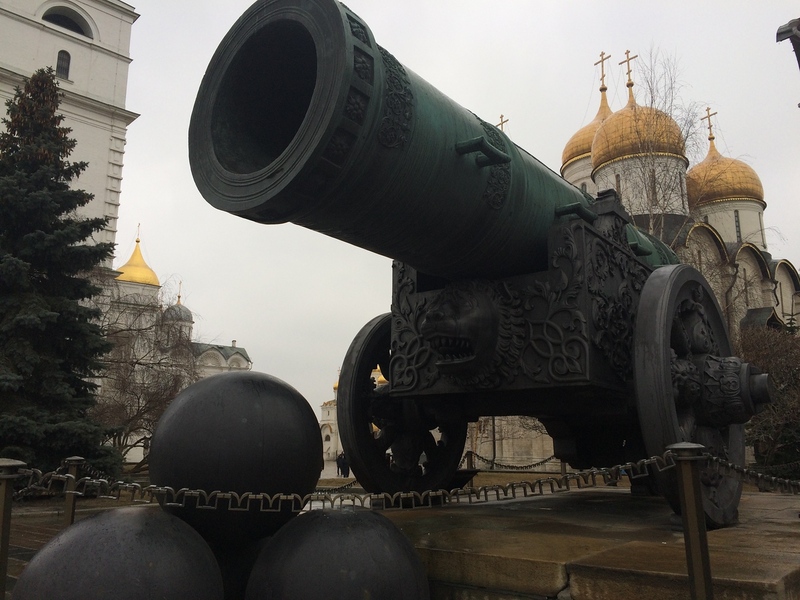 These are the Tsar Cannon and Tsar Bell, which are the largest cannon and bell to ever be produced. Both are too large to serve their intended purposes. Tsar Cannon, weighing at 40 tons, was never fired. 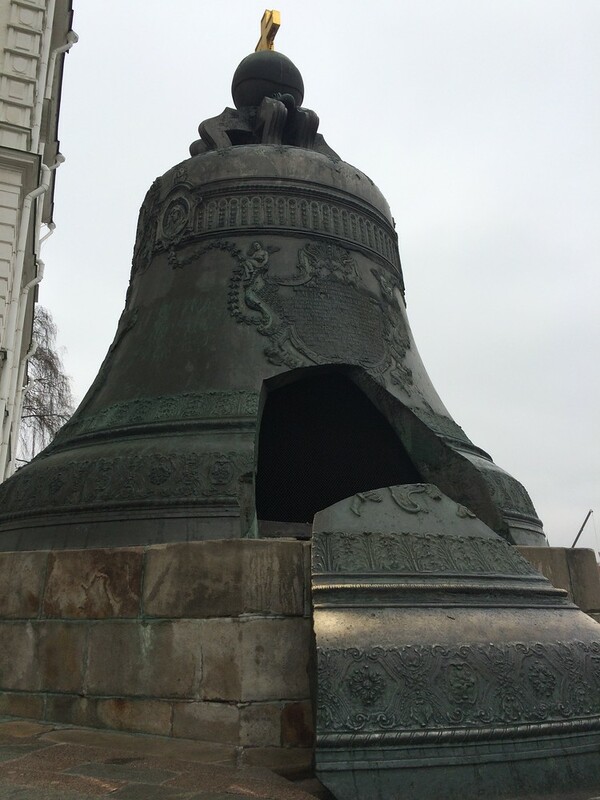 Tsar Bell, weighing 202 tons, never rung and never will due to a major crack on the side. Moving into the square, the Kremlin’s three main churches is seen. Each one had a designated purpose for the Tsars and their families. These purposes represent the circle of life — from baptism, to marriage, to death. The Annunciation Cathedral was destined for baptisms, and other familial ceremonies. Although the Annunciation Cathedral is not large, with only four columns dividing the Cathedral into three naves, a balcony is one unique feature of this Cathedral. The main event, though, is to stare in awe at one of the oldest, surviving multi-tier iconostasis in Russia. Over one hundred icons are displayed on six rows and each icon is wrapped in a gold frame. The Cathedral’s frescoes were painted after the fire of 1547. They depict events occurring in the sky, calamities happening to the earth, and the fight between good and evil. The Assumption Cathedral is the main burial place of Russian patriarchs. Five golden domes and four semicircular gables grace this stunning Cathedral. The interior is unusually bright, colorful, and spacious for fresco Cathedrals. Glorious golds, reds, and blues captivate the imagination. Pillars flaunt pictures of martyrs because martyrs are the pillars of faith. 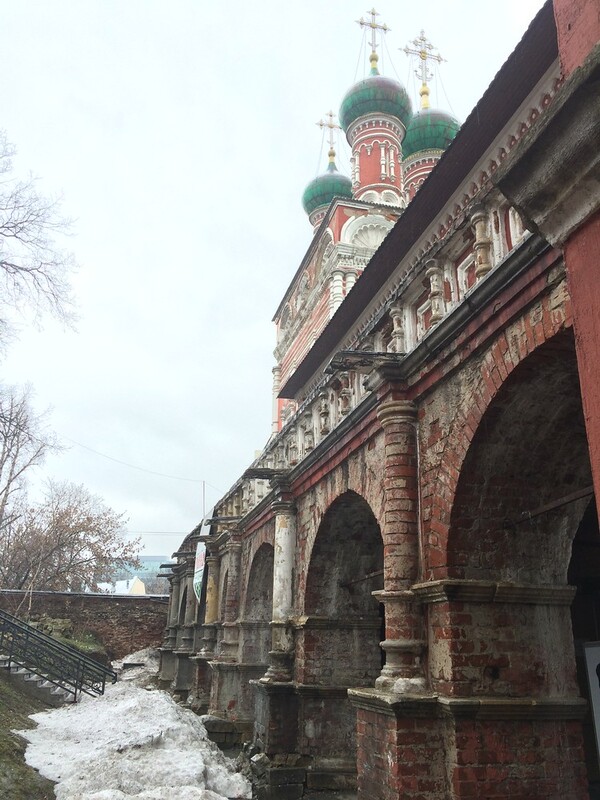 Here stands Ivan the Terrible’s throne, as well as the patriarchs’ and Tsarinas’ praying places. If there is time to visit only one Cathedral in the Kremlin, this should be it. Unfortunately the third and final significant Cathedral was closed to the public for a private event during my Kremlin visit. You may notice three bars on the Russian Orthodox cross, and the bottom bars occasionally angled. Apparently this angle represents a connection to heaven and hell because one criminal said before dying, “in God I trust,” and the other criminal did not. The criminal declaring faith in God ascended into heaven and the other criminal descended into hell. Founded in 1511 by Vasily III, the Armoury manufactured and stored weapons and regalia. Today it contains Russian state treasures. It is a highlight of any visit to the Kremlin. Gaze at the stunning Faberge Eggs, exquisite royal carriages, stunning Tsarist gowns, and much more. The Armoury offers visitors a fascinating look into Russian royalty. I disliked the Tower of London in England, but loved the Armoury in Russia. Trust me — you do not want to miss this. Please be mindful that photographs are not allowed inside the Armoury. You will want to avoid the upsetting the ladies who watch visitors. 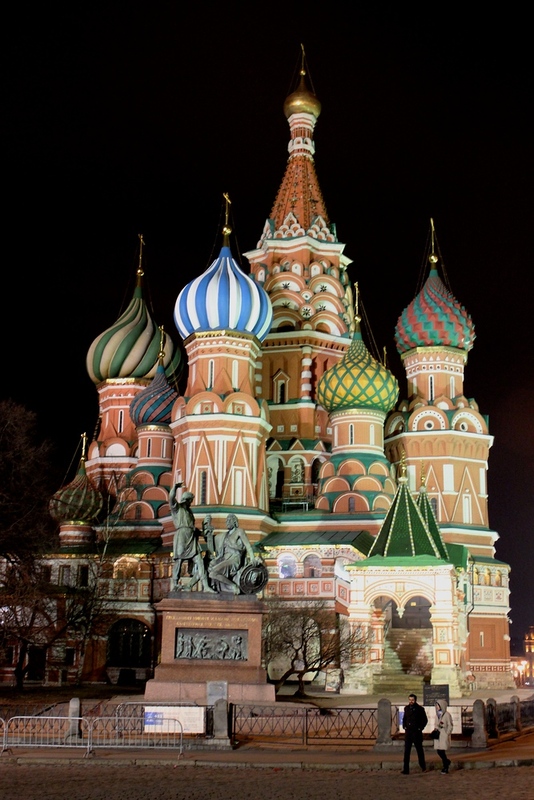 Saint Basil’s Cathedral is the iconic spot in Moscow and a symbol of Russia. Unique colors, patterns, and shapes distinguish St. Basil’s from all other Cathedrals. 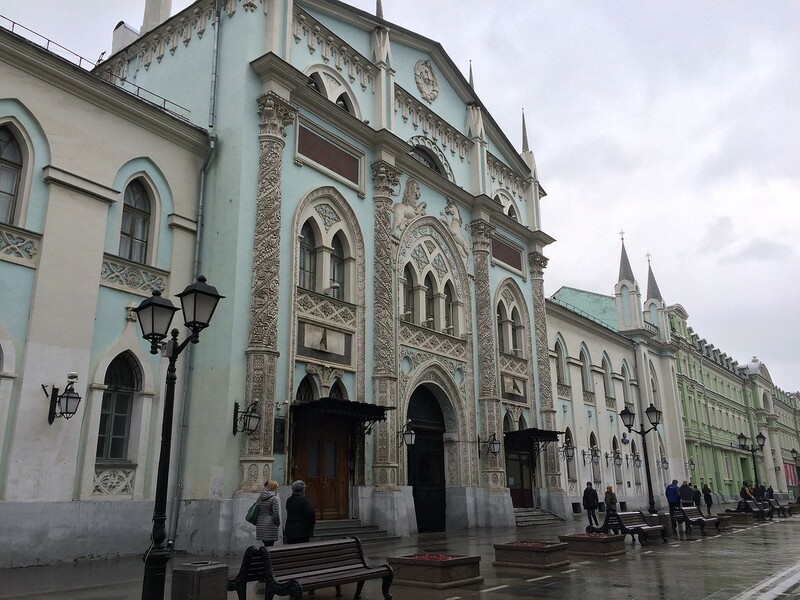 Ivan III commissioned the officially known Intercession Cathedral to commemorate capturing Kazan from the Tatars. This masterpiece required only seven years to construct. Legend explains Ivan blinded the architects so they could never again build anything as beautiful as St. Basil’s Cathedral. Records show, however, the government employed the architects after Ivan’s death in order to add an additional chapel to the structure. Pronounced “goom,” GUM (an acronym for glavni universalni magazin, or main department store) is a bustling and bright shopping mall. 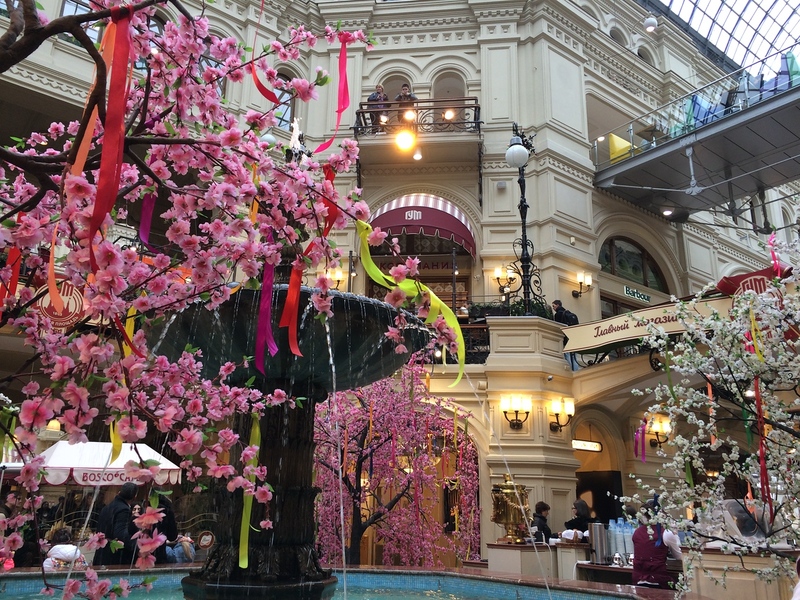 It is the shopping center in Moscow and hosts hundreds of high-end stores and restaurants across three levels. Explore the suspended bridges, waterfalls, and colorful flora; no purchase of overpriced goods required. A skylight roof brightens the mall, even on gray and rainy days. It is easy to forget you are in cold Moscow when walking amongst warm Italian-esque architecture. Although there are several of these memorials throughout Moscow and Russia, the Tomb of the Unknown Soldier in Moscow is a sort of national pilgrimage spot. For example, many newlyweds bring flowers to the tomb. The inscription reads, “Your name is unknown, your deeds immortal.” The Soviet cities who witnessed the heaviest fighting between 1941 and 1945 are inscribed on the tomb as well. Soldiers guard the eternal flame and change guards every hour on the hour during a perfectly synchronized ceremony. 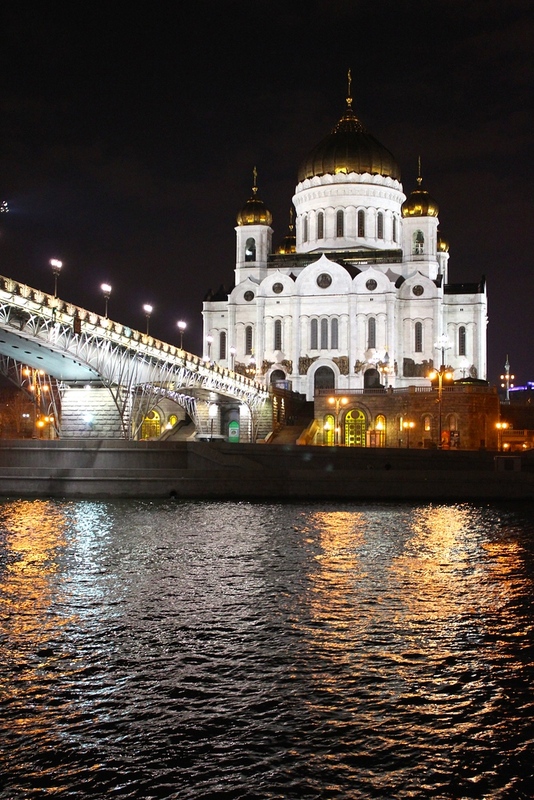 The highlight of my time in Moscow was a night walk with friends from Christ the Savior to the Kremlin along the Moscow River. Few people wandered the streets at this time, allowing us to enjoy these beautiful sights in peace. We took many photos, goofed around, and simply stood in awe at the beauty around us. Christ the Savior is a new Cathedral — completed in 1997, in time for Moscow’s 850th birthday — which flaunts opulence, grandiose, and class. Previously, a Cathedral of the same name stood here and commemorated Russia’s victory over Napoleon. Stalin destroyed this Cathedral in order to construct a Palace of Soviets and a one hundred meter statue of Lenin. Stalin’s plans literally never left the ground because of the swamp-like qualities of the site. It had held a massive religious site for years, but could not hold a statue. Some Moscovites believe this is telling of communism and/or Stalin’s leadership. Instead of a statue and palace, the site served the world’s largest swimming pool for fifty years. Perhaps I am prejudiced, but I prefer the Cathedral over a Soviet palace or swimming pool any day. Touring cemeteries usually does not interest me. Why would I want to stare at a gravestone of a dead person I had never met? Gravestones are not extremely telling of his or her accomplishments, defeats, or character. 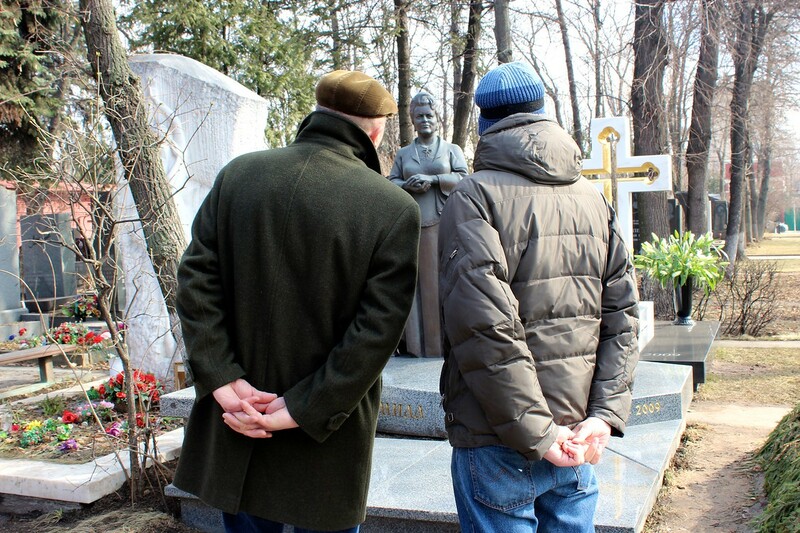 My dissatisfaction in cemeteries changed with Novodevichy Cemetery. Filled with some of Russia’s most notable figureheads, Novodevichy impresses the eyes. Each tombstone is a work of art — a masterpiece all on its own. Novodevichy Cemetery is like an outdoor art exhibit, only each art piece represents the life of a historic figure. 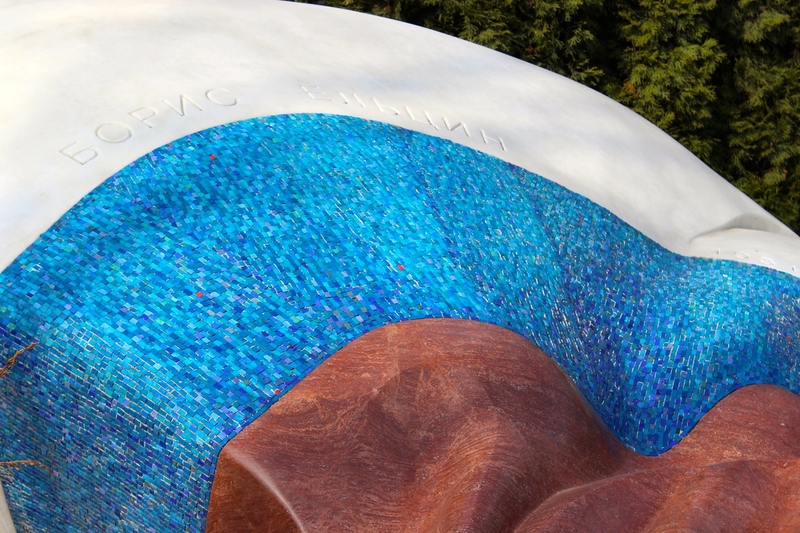 It is the most prestigious resting place in Moscow with famous names such as Checkov, Gogol, and Yeltsin buried here. Maps are available for purchase at the kiosk, or hire a private tour guide. 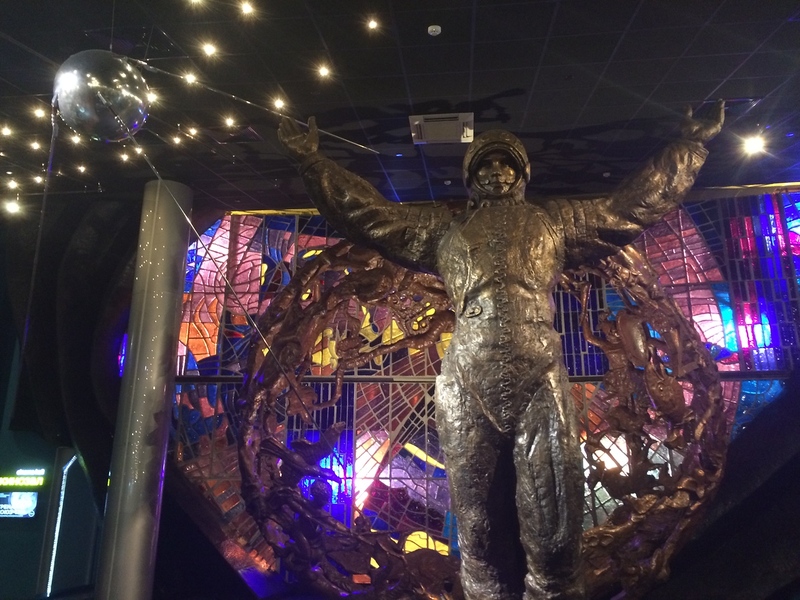 In a quest to experience the lesser-known, I visited the Cosmonautics Museum near the VDNKh metro station. I accidentally visited on the free-entrance day. On one hand I saved two hundred roubles, but on the other hand I waited 1.5 hours in the chilly rain. The museum is mostly in Russian, thus reducing the value for an American whose Russian language level gets her barely through the day. Despite my lack of space-related Russian vocabulary, the space paraphernalia and propaganda wowed. Outside the Cosmonautics Museum is the Monument to the Conquerers of Space. 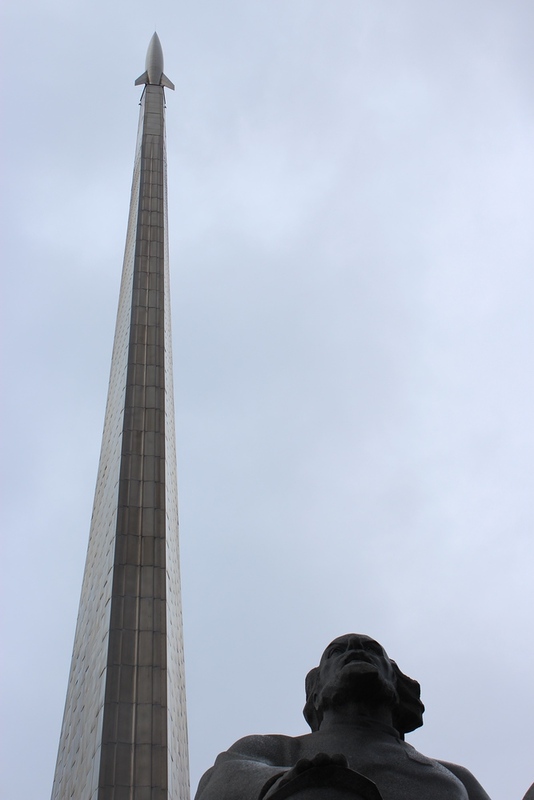 Built in 1964 to commemorate the launch of Sputnik, the soaring one hundred meter monument even had this proud American inspired by Russia’s space race success. If these two stops have not filled your space hunger yet, a visit to the Moscow Planetarium will be worth it. 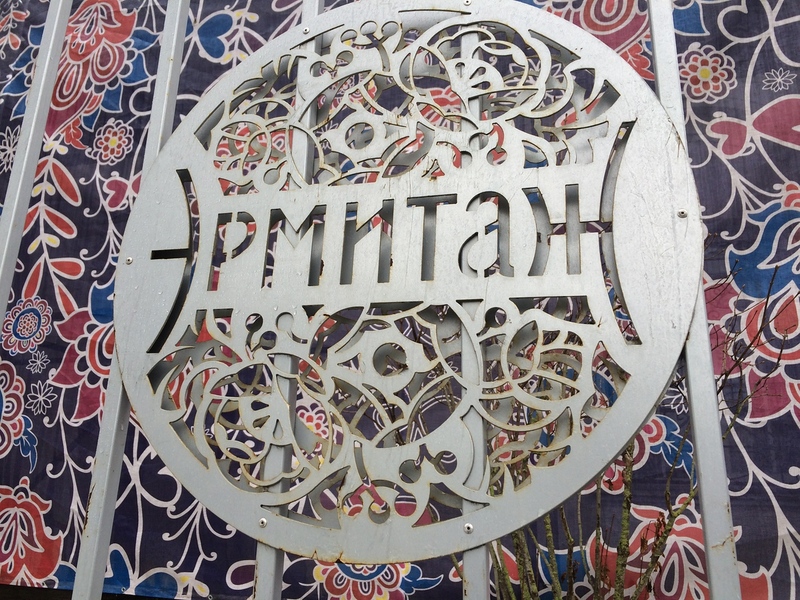 As often found throughout Russia, English translations are rare within the exhibits. The planetarium is split into several rooms, each requiring an individual ticket. I visited the main attraction — the Large Stall Hall. Here you can explore the roots of space knowledge, learn more about meteorites, and more. Watch out though — the exhibit is costly in comparison of other attractions, coming in at 550 roubles. Not originally child-friendly productions, the owners of Moscow Circuses found it profitable to make the circus a family-friendly event. This particular circus was founded in 1880 and named after the actor and clown Yury Nikulin, who performed here for many years. Each show centers on an original theme, but I did not notice any added cohesiveness with the inclusion of a theme. As a child, I screamed and kicked when my father insisted I attend a circus with my cousin. Circuses never sat right with me. Perhaps Dumbo, a childhood favorite film, is to blame. Supposedly Moscow’s circuses do not mistreat animals (anymore). I still cringed at the involvement of animals and doped animals available for photographs. 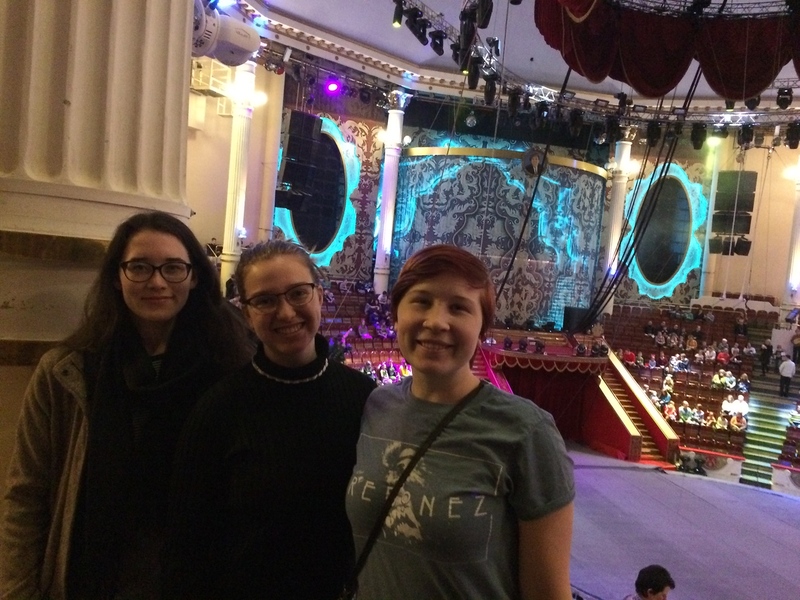 I will not attend again, but if you are looking for an original Moscow experience, you will find it at the circus. With hundreds of attractions in Moscow, and all worth your time, this capital city can be overwhelming. 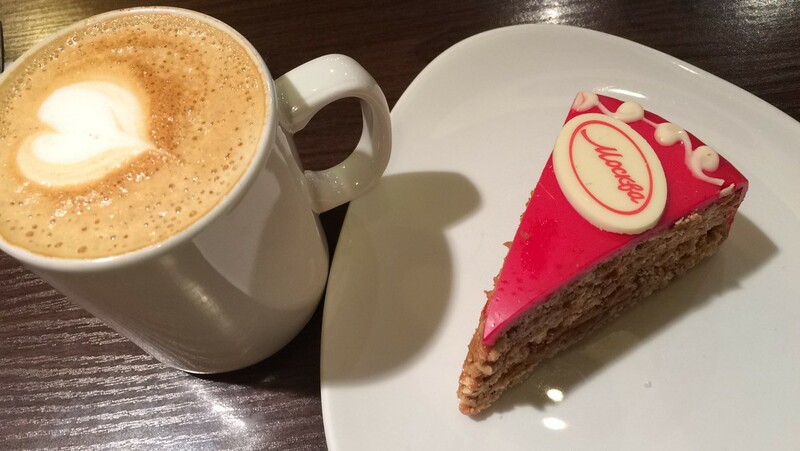 It is no surprise I often found myself sitting in a cafe to read or people watch and wandering the endless streets. One gloomy, rainy day I decided to simply walk towards whatever spirals I saw in the sky. 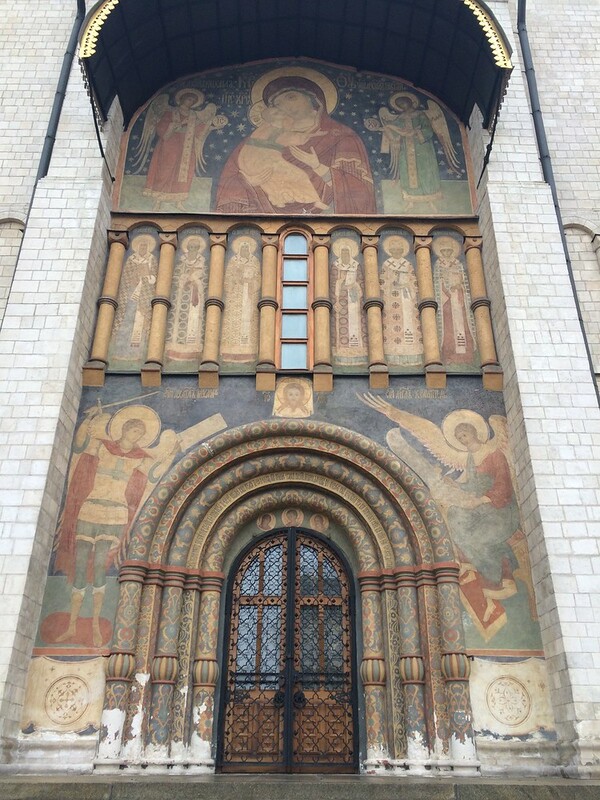 This mini-adventure led me past churches, gardens, monasteries, and street art. I explored Hermitage Gardens, a hip park full of food and art. Apparently during the summer months, Hermitage Gardens includes concerts and festivals almost daily. It also boasts an amazing playground for children. I had to remind myself several times of my age to prevent me from joining the fun. En-route was the Church of the Nativity of the Virgin in Putniki, Novospassky Monastery, street art, sculptures, and theaters. Perhaps true for every city, but especially true for Moscow, wandering is the best way to familiarize yourself with this expansive city. As I walked from Cathedral to museum to metro stop, I could not help but wonder why this incredible city and I were struggling to come to terms with each other. 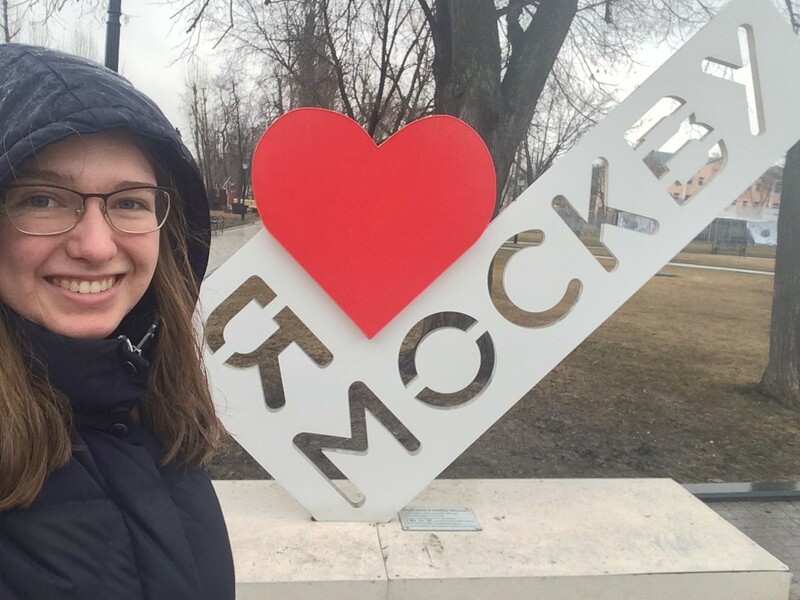 Finally I realized Moscow should be experienced, felt, and understood. None of that is possible with a short period of time. Too many coffee breaks provided me the time required to soak in Moscow’s beautiful complexities. Moscow in four days is an introduction, and that is all it will remain. Moscow’s complexity deserves time, understanding, and recognition for all it is, has been, and will be. Despite Moscow Metro’s expansive reach and easy use, four days is not enough time to experience everything. Do go to Moscow, and do return. What most interests you in Moscow? Let me hear it in the comments below! 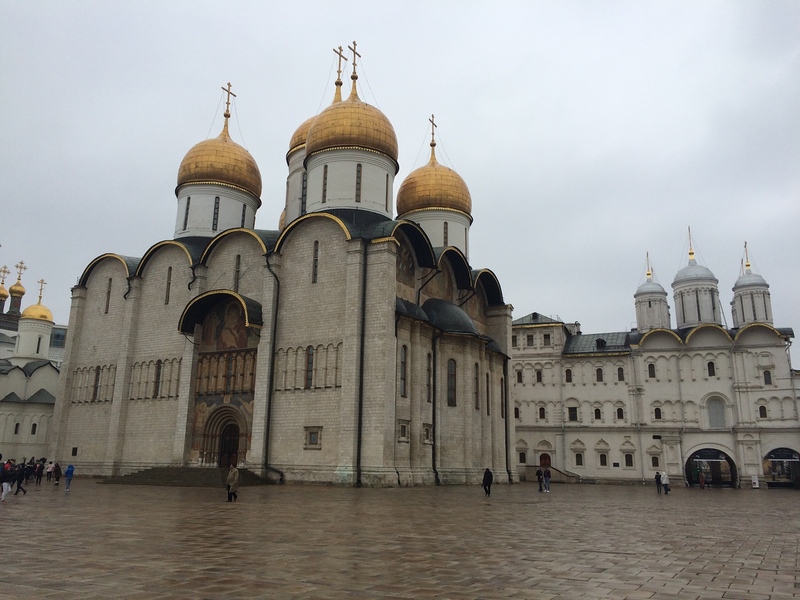 Russia was not on my “must see” list, but after reading your blog I will have to add it to the list. If you can only see one site in Moscow, what would you recommend?